The Italian Association of Systems Medicine and Healthcare (ASSIMSS) is a national interdisciplinary and inter-professional, no-profit, scientific society born to develop, promote and disseminate a systems science approach to medicine and healthcare endorsing the 4P Medicine paradigm in 3 main branches: clinical medicine, basic/clinical research and management. It was born in 2014 from 26 founders from different disciplines: medicine, nursing, psychology, management, engineering, pedagogy, philosophy and epistemology, ethics, sociology, maths and physics, medical humanities, system science. ASSIMSS encompasses five main working groups: Modelling and Prediction, Personalisation and Participation, Health and Prevention, Management and Caring Complexity, Professional identity and Education. The society main activities are to promote, organise and coordinate: clinical and biomedical research programs; operational connections and co-construction among professions and disciplines; new systemic models of professional, management and research activities; knowledge building; cultural dissemination for citizens at large; training and education for professionals; official position documents and guidelines. 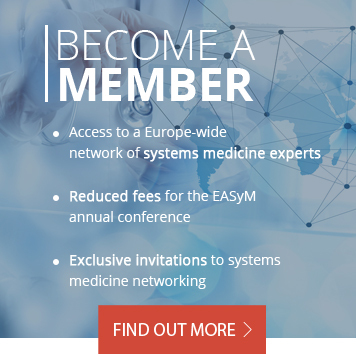 ASSIMSS organises an annual scientific congress with a dedicated joint session with EASYM. Any person, professional, society, or private/public body can apply to become a member. BioM Biotech Cluster Development GmbH represents the biotechnology sector in Munich and Bavaria. BioM recognizes the challenges of the medicine of the future and supports its development by identifying and connecting matching partners from science, industry, medicine, finance and politics. BioM facilitates the process from innovation to application in many ways. Within our scope, we are the central point of contact inside Bavaria and between Bavaria and the world. The covered geographical area comprises an enormous quantity and quality of resources for Systems Medicine. The Munich metropolitan area alone hosts two Universities of Excellence, three biologically and medically-oriented Max Planck Institutes plus Helmholtz Research Centre, two university hospitals as well as 60 other clinics. This is complemented by about 270 biotechnological and pharmaceutical companies, and an advanced start-up infrastructure. Bavaria and BioM are internationally recognised as a hot spot in fields relevant for Systems Medicine. Biomax Informatics AG is a Munich based SME that, since 1997, provides services and computational solutions for better decision making and knowledge management in the life sciences. Our special focus are semantic knowledge representation, data integration and knowledge aggregation. Within Systems Medicine projects we establish solutions which integrate electronic health records, clinical and environmental data, experimental results and general knowledge on the affected morbidities. Our solutions help to provide individually tailored care suggestions and improve the quality of life for diseased patients. Heel is a pharmaceutical company specialized in developing and manufacturing medicines madefrom natural ingredients. The various pharmaceuticals have been used over decades for the treatment of many diseases. Heel has a strong commitment to scientific research in order to create scientific evidence on efficacy, safety and mode of action. With the help of cutting-edge research technologies, practice-based and experimental clinical research, Heel is dedicated to continuously broaden the knowledge base on its products. Heel’s long-term goal is to develop therapies which are tailored even more to patients’medical needs. At MicroDiscovery, we develop hardware and software solutions for mobile diagnostic applications.Our products are focusing on enhancing user experience while assuring a high reliability of data from biomedical applications. Our particular expertise lies in the customer-oriented hardware adaptation and development of software in the fields of in vitro diagnostics and medical devices. We have in-depth knowledge of the relevant international directives such as 93/42/EWG, 98/79/EC, 2007/47/EC, CFR21 part 11, CFR820and MPG. We develop in conformity with the processes defined in ISO 13485, ISO 14971, ISO 62366and create ISO 62304-compliant software and documentation.